Dr. Hassan Minhas is a psychiatrist in Stamford, CT specializing in child and adolescent psychiatry, bipolar disorder, autism, anxiety, ADHD, and schizophrenia. With advanced training in child and adolescent psychiatry, he is experienced in treating many childhood onset conditions. He offers sessions in English, Urdu, Hindi, and Punjabi. 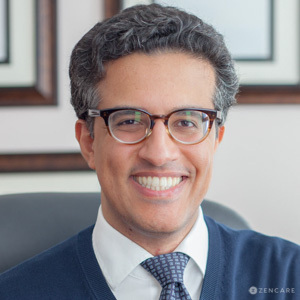 Dr. Hassan Minhas is a Yale and Brown University trained Child, Adolescent, Adult, and Forensic Psychiatrist in Stamford, Connecticut. He is an Assistant Professor of Psychiatry at Yale School of Medicine, and serves as the Director of Outpatient Autism Services at the Hospital for Special Care. He has expertise is in child and adolescent psychiatry, Bipolar Disorder, Autism Spectrum Disorder, anxiety, ADD/ADHD, and addictions. In addition to outpatient psychiatric care for children and adults, he is also available for forensic analysis and expert testimony. Dr. Minhas has advanced training in Child and Adolescent Psychiatry, and is experienced in treating all types of childhood onset conditions. Due to a host of factors including genetics, brain formation, and environmental stress, children may suffer from psychiatric symptoms including developmental disabilities, Autism Spectrum Disorders, ADHD (Attention Deficit Hyperactivity Disorder), anxiety, depression, OCD (Obsessive Compulsive Disorder), PTSD (Post-traumatic Stress Disorder), Bipolar Disorder, and Psychotic Disorders including Schizophrenia. Dr. Minhas is experienced in treating and managing all of these illnesses, and encourages families to take early intervention for better prognosis. Dr. Minhas is also trained as a forensic psychiatrist and offers expert psychiatric opinions to courts and attorneys. These opinions may be required or helpful in a variety of criminal and civil cases. Dr. Minhas is available to act as a consultant on a case, or to perform evaluations, write reports, and be available as an expert witness and testify in state and federal courts. Dr. Minhas aims to provide holistic care that is informed by both a deep understanding of biology, as well as psychological, cultural, and spiritual factors. His philosophy is to treat the individual as a whole – not just the disease. He offers sessions in English, Urdu, Hindi, and Punjabi. See Dr. Minhas's website here. Schizophrenia – Providing medications and therapy for individuals with hallucinations, delusions, and for people who have had a "break from reality"
Dr. Minhas is not in-network with any insurances. Therapist's note: Dr. Minhas can provide you with paperwork for reimbursement from your insurance company if you are seeking out-of-network sessions. "My treatment approach is holistic - it is important to take into consideration not only underlying biological factors, but also psychological, social, and spiritual. With advanced training in psychiatry, a background in genetics research, and sub-specialization in pediatric and forensic psychiatry, I am adept at addressing a wide variety of issues, including serious neuropsychological disorders, and providing effective treatment." Dr. Minhas exudes a rare blend of intellect and warmth. His ability to decipher complex psychopathology and provide alleviation from suffering is an incredible offering. I have known many patients who have been able to heal after working with Dr. Minhas.